This is what happens when you hire a cheap paparazzo to take your album cover photo – eyes half shut. Kvaka’s successful career spans over three decades. 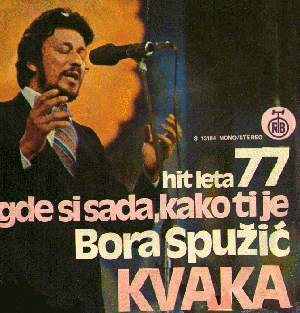 Known as the last romantic of Serbian folk music he’s piled a hit after hit. Although the only keyboard he’s ever seen is that of an accordion, several of his songs have been committed to digital computer formats. One of the finest “Lost Hopes” will gently play through your computer if you click here. Note: the MP3 was removed by the owner so I killed the link. 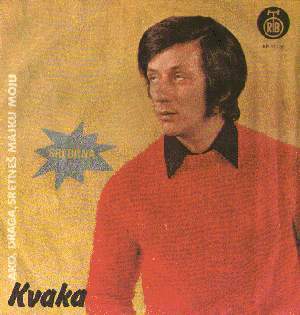 While all other artists of his time drank excessively and were occasionally hooked on harder stuff, Kvaka preferred smoking a dubie. It relaxed him and calmed his nerves during long tours. The squinting eye side effect didn’t bother him the least. 50% eye closure saves retinas from stage lighting. It’s like natural shades of a sort. He was also dabbling in the spiritual realm. The 45 single cover where he’s wearing a red sweater is from this older spiritual phase. He is channeling the beings from the other side. Check out how he’s rolling his eyeballs the exorcist style. The title of this single is “My Love, If You Should Ever Meet My Mother.” The words kind of imply that both the mother and his love may be deceased, or at least his mother is dead and his girlfriend is about to join her. So much meaning is packed in a five word song title. Then in 1977 he came to his senses, accepted Christ into his heart and became a minister. Incidentally the title of this single is “Where Are You Know, How Are You Doing?” Could this be related to the aforementioned soon-to-depart girlfriend? You be the judge. As for me, I just love the photograph on this record. Eyes are now fully closed, the hands are doing the talking and the mouth is speaking in tongues. 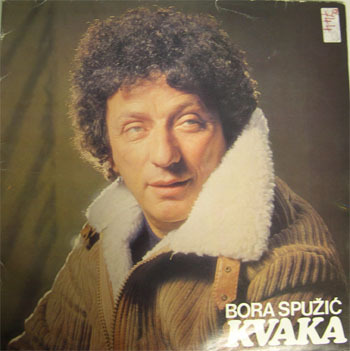 This entry was posted in Records and tagged Bad record covers, bora spuzic kvaka, folk, serbia. Bookmark the permalink.